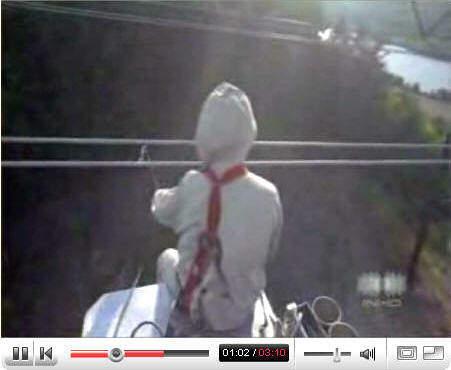 No, this is not a Jedi knight zapping a high voltage line. The metal threaded into this cloak creates a Faraday shield for the lineman as he works on a 500 kV transmission cable after being dropped off by a helicopter. Cool indeed! We here at RF Cafe fully support law enforcement, and this video was made with the help of the Denver police force. 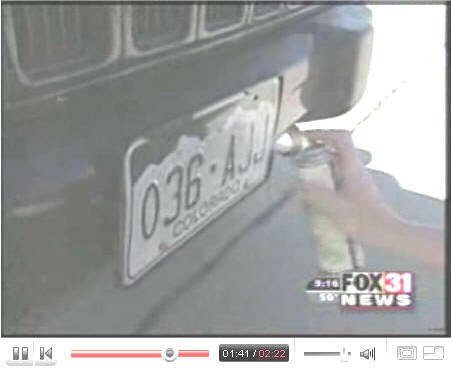 Here, the news crew tests 3 products that are supposed to provide stealth to the automated traffic radars that snap photos of license plates, and then mail you your ticket. Some actually work! 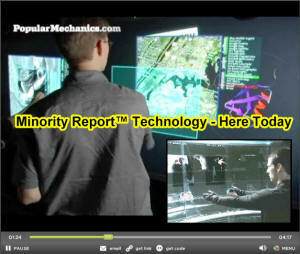 Microsoft is now putting Minority Report display technology on your coffee table. This is a must-see video. Coming to conference rooms and navigation systems near you. Microwave fireworks for the 4th of July. This is relevant - it involves microwaves and it is science. According to the Brainiac experimenters, "We do these experiments...so you don't have to." Morse Code vs. Text Messaging (SMS) contest on Jay Leno. Which do you think won? The audience chose SMS. Here is an alternate source for the video. Thanks to Cornell D. for sending this. According to this YouTube video, here is how a REAL engineer cooks a hot dog. Sure, it is a sales pitch for Blendtec Total Blenders, but what a great promo idea this "Will It Blend?" website is! Watch as a perfectly good iPhone is dropped into a blender and then Smoothie button is pushed. You will be amazed at the outcome. Watch KB2GSD give a video tribute to Ham radio. You know him as Walter Cronkite. ...and that's the way it is. Honeywell's Micro Air Vehicle has a curious resemblance to the Imperial Probe Droids in Star Wars: The Empire Strikes Back. The MAV is basically a ducted fan with a 10,500 foot service ceiling, 50 kt airspeed, up to 100 waypoints. I have never really understood why Macs languish so far behind PCs when they seem to be much more user friendly. I must admit, however, to having never owned one. That is primarily because PCs have dominated my places of work. Anyway, these Mac vs. PC commercials are extremely clever. If Macs really do suffer user assaults like PCs do, Apple does a good job of keeping it quiet. This video of an overcharged lithium-polymer (Li-Po) battery will make you worry just a little about the one sitting inside your cellphone, camera, or laptop computer. I use them in my R/C airplanes. Li-Po cells are generally considered safer than lithium-ion (Li-Ion) cells, but they can - and do - still catch fire in the wrong conditions. Meet Pedro the Voder - the world's first electronic speech synthesizer. Bell Telephone Laboratory's Voder was a sensation at the 1938 New York World's Fair. The "girls" who worked this modern wonder used hands and feet to generate vowels, consonants, stops, and inflections of any language. Listen here.